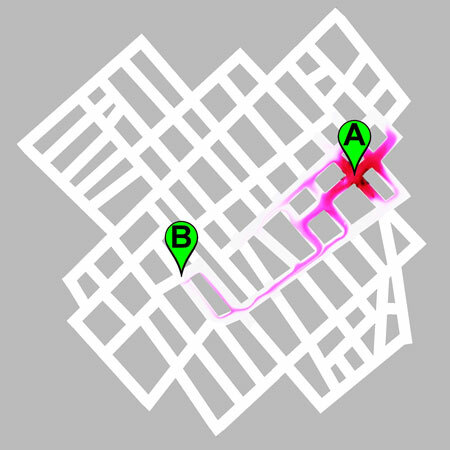 (Nanowerk News) You don’t always need GPS, a map or a compass to find the right way. What demands a tremendous amount of computational power from today’s navigation computers can also be achieved by taking advantage of the laws of physical chemistry and practicing so-called “chemical computing”. The trick works as follows: A gel mixed with acid is applied at the exit of a labyrinth – i.e. the destination – filled with alkaline liquid. Within a shorttime, the acid spreads through the alkaline maze, although the majority of it remains together with the gel at the exit. When an alkaline solution mixed with dyes is now added to the other end of the maze, i.e. the entrance, it automatically seeks the way to the exit – the point with the highest acidity. A map excerpt of Budapest featuring the experiment, which involved finding the shortest route from the starting point (A) to a pizza restaurant (B). This process is an example of the Marangoni effect, which works because the acid distributed in the maze reacts with the newly added, dyed alkaline solution. The latter is repelled by the mixture of alkaline liquid and acid in the maze and pushed to the source of the acidity at the exit, leaving a clear trail in its wake thanks to the pigment. In doing so, the dyed alkaline solution tends to opt for the shortest path. In the rush, however, it also takes alternative routes – albeit with a considerably lower probability and thus with a weaker trace of color. “The advantage of this chemical computer over its electronic counterpart is that it finds all the possible routes virtually in parallel. A normal computer calculates step-by-step one possibility after another, which takes longer,” explains Rita Tóth from Empa’s Laboratory for High Performance Ceramics. Although methods to find such pathways using liquids already exist, the new technique is the first that works purely chemically and where a color trail shows the path immediately. As the next step, the research team is now looking to attempt larger and more complex mazes, the test object only being a few square centimeters in size. Nonetheless, the method has already passed a test “out in the real world”: In a somewhat larger maze based on a Budapest neighborhood, the colorful alkaline solution traced the shortest route to its target, a pizza restaurant. Eventually, the system could also be used in transport planning. And scientist Tóth also envisages the potential for applications in experimental psychology, network and graph theory and robotics. At any rate, the team’s results have already been met with a great deal of interest; the paper is one of the most read in the journal Langmuir ("Maze Solving Using Fatty Acid Chemistry").